until 10 PM Mountain ONLY while supplies last! Here’s a chic take on belt storage! Miche’s Cintura Bag is so versatile, you can wear it cross-body style or around the waist for the ultimate in hands-free convenience! 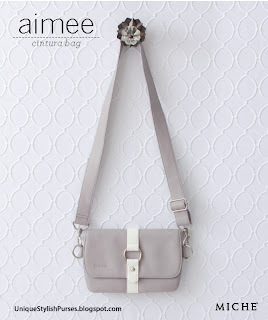 Soft textured faux leather in dove grey and white strap detail with carabiner and rivet accents. Thanks to Miche's Aimee’s built-in back belt loops, you don’t even have to use the Belt Strap (included) unless you want to, just attach to your belt and GO! Black fabric-lined interior features four card slots.